Fairing and engine case protectors for Kawasaki motorcycles by Lust Racing. Crash protectors protects your motorcycles engine cases and frame in the event of a drop. 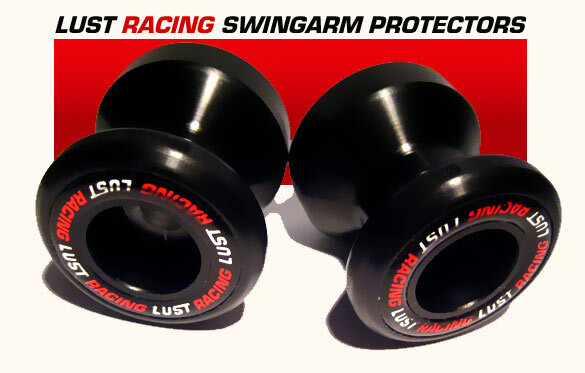 Our high quality crash protectors cost a fraction of what the damage even from a low speed drop could cost to fix, in addition Lust Racing crash protectors have a high finish and an appealing design enhancing the overall look of your bike. The crash protectors on this page fit Kawasaki Z1000 models manufactured 2007 - 2009 and 2010-2018.. We use high quality duralon developed especially for motorcycle crash protection. New high tensile steel mounting bolts, washers and copper grease are all included in every crash protector kit along with installation instructions. *Swing arm protectors for Kawasaki ZX10 year models 2008-2009 CAN NOT BE FITTED WITH STANDARD EXHAUST END CAN. The swing-arm protector can touch the standard end can during the suspension travel on the ZX10 08-09. With aftermarket end exhaust you may be able to fit swingarm protectors on the ZX10 08-09 but DO check that you have sufficient clearance for the full suspension movement.